VICTORIA – All 44 elected MLAs from the B.C. New Democrat and B.C. Green caucuses have ratified an agreement pledging to work together to support a stable New Democrat government that works for people. “The people of B.C. spoke loud and clear on election day – they want a government that works for them, not just those at the top. With the signing of this historic agreement, we are showing that we are ready to roll up our sleeves and work together to make lives better for British Columbians,” said John Horgan, leader of the B.C. New Democrats. “The results of the election clearly demonstrated that voters wanted to put an end to the bitter, divisive and cynical politics of the past, and get on with productive governance. 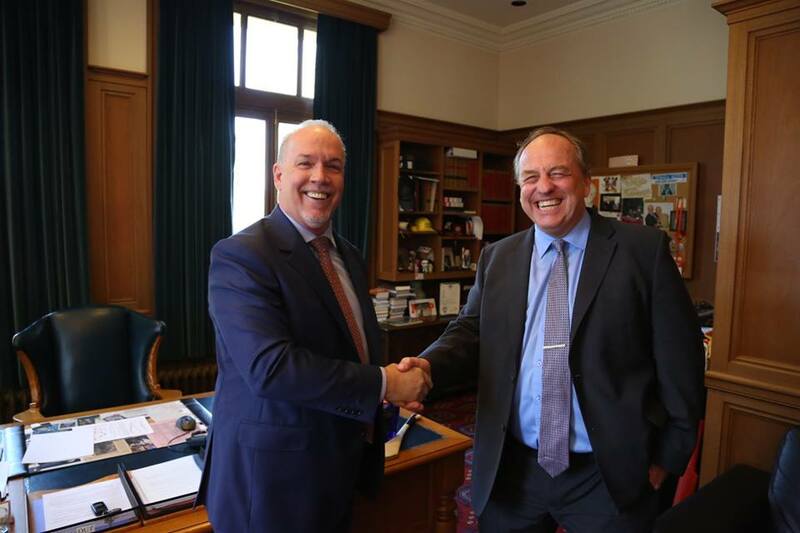 Today, I am very proud to stand with John Horgan and our respective caucuses to demonstrate how two distinct parties can work together for the good of all,” said Andrew Weaver, leader of the B.C. Greens. “This agreement establishes a relationship of ‘good faith and no surprises’ between the B.C. Green caucus and a B.C. New Democrat government. It is our hope that it becomes a model for future B.C. governments, where working across party lines is quite ordinary. I have always believed we are better off when diverse views can be represented at the table. This is a new era for politics in B.C. – one where British Columbians are truly the winners,” said Weaver. “British Columbians have been waiting 16 long years for solutions to so many problems, and we want to help. A New Democrat government, with the support of Green MLAs, will make life more affordable, fix the services people count on, and build a sustainable economy that works for people. This agreement means we have the opportunity to make those changes that are so important. I’m optimistic and excited for the future,” said Horgan.